Create your own funny photo effects with various characters now at Photomica.com. It is easy to create such images because you just need images and must know how to upload them on the online photo-editing template. Just drag the photos to their right position and save them on your computer. 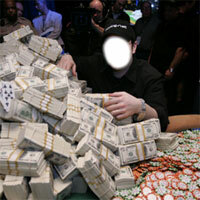 Adjust your face in the poker fun effect here on this page. Share such images on facebook with your friends or you may surprise your friends by their funny pictures. The best part is that these photo effects are not paid and free of cost. You must tell your friends about Photomica.com.